Two Years After A Violent Altercation At A S.C. High School, Has Anything Changed? A video of a school resource officer throwing a student sparked a national debate about race, discipline and the role of law enforcement in schools. "At first I didn't pay attention, because she was a more quiet student," Kenny recalls. "So I'm like ... She can't be getting in trouble, because she doesn't do anything, she never talks in class." The teacher asked the unnamed student to give up her cell phone. When she refused, he called in a school administrator. Then the administrator radioed one of the school resource officers. By now, all the other students had snapped to attention. Kenny urged her classmates to take out their phones and start filming. She said that she'd heard rumors that the SRO had "slammed" students. In one those videos — since viewed by hundreds of thousands of people — the officer can be seen asking the unnamed student to get out of her seat as he approaches her. When she refuses, he flips her desk onto the ground and flings her out of her seat and across the floor. "I'm in the classroom yelling, 'What did she do? She didn't do anything! Are we really going to let this happen?' " Kenny remembers. She was furious, crying and shaking. She recalled that the SRO turned to her and said: "Oh, you have a lot to say? You're coming too." She spent the day at a local detention center. The incident, and those online videos, sparked a nationwide discussion about race, discipline and the role of these resource officers in schools. Kenny and the unnamed student are black, the SRO white. It brought investigations, too, in the Richland Two school district and across the state. The school board described it as an "outrageous exception" to how their schools enforce discipline. And Leon Lott, the county sheriff, fired the officer two days after the incident. Lott told reporters that watching the video made him want to "throw up." Officials pledged to rethink disciplinary policies and the role of school resource officers. Two years later, some feel it's still unclear what those efforts have yielded. I visited the district recently to see how things have changed. Every state in the U.S., except Hawaii, has schools with law enforcement officers, according to the U.S. Education Department. SROs are more often found in schools with large black or Latino student populations. The racial inequalities in school suspensions and discipline are well known. Black girls are 2.6 more likely to be referred to a SRO than their white classmates, and almost four times as likely to get arrested in schools, according to Georgetown University researchers. Enrollment in the 28,000-student Richland Two district is nearly 60 percent black. One of the first people I met with there is Hugh Harmon. He's head of the Richland Two Black Parents Association. The group advocates for better special-needs education and more consistent disciplinary policies, among other things. Harmon's youngest daughter, 13-year-old Chai, is set to attend Spring Valley High in just a few years. And like a lot of other parents, that video was painful to watch. "If it was my daughter ... I would have absolutely lost it," Harmon tells me, sitting at a folding table in the church he runs. "My professionalism out the door. Daddy, protection, would have come out." Most parents say Spring Valley is a good school with good academics. But Harmon and the black parents' group are no strangers to concerns about inequalities when it comes to school discipline and SROs. "You start to wonder, is it an issue with the students or is it an issue with the system?" Harmon says. As for SROs, Harmon says he and his group had been asking for some time: "Is he a school police officer, or is he a resource as the name suggests?" For answers, I went to see Sheriff Lott. SRO's "have many hats," he says: "educator, protector, counselor, a little bit of everything that's needed to build a relationship with our young people. And of course, they enforce the law — and make arrests if necessary. But there's one thing Lott says his SROs do not do. Discipline. Sheriff Lott tells me that what happened two years was a turning point for his department — he fired the officer. Richland Two still has SROs, but his department has been working with the school district to make their roles clear. But, Lott says, there's one thing that hasn't changed yet. In that 2015 incident, both female students were charged with violating the Disturbing Schools law, a state statute that dates all the way back to 1919. It's considered one of the nation's broadest school disciplinary laws. When enacted nearly a century ago, its goal was to protect students at all-girl's schools from trespassers committing "obnoxious" behaviors. That included flirting boys. But over the years it strayed from that intended meaning. By the height of the civil rights movement, the law was being used to quash student protests in classrooms, according to Josh Gupta-Kagan, a law professor at the University of South Carolina. As recently as the 2015-2016 year, it was the second most frequent delinquency charge in South Carolina. And it's used disproportionately on black students. Between 2006 and 2009, 76 percent of all children sent to family court through the Disturbing Schools law were black, according to a report from the state's Department of Juvenile Justice. "If you've got a kid who is black," Gupta-Kagan says, "there's a decent amount of research that shows that good, well-intentioned and not overtly racist people will look at that situation and judge it to be more threatening if it involves black kids." Gupta-Kagan said he's identified at least 20 other states with similar laws. Sheriff Lott in Richland County is an outspoken critic of the South Carolina law. "If you're chewing gum, and I told you to take the gum out and we're in a classroom and you don't take it out, you could be arrested for disturbing school," he said. "But are you really disturbing school?" When asked about the law's disproportionate effect on black students, Lott responded: "It's just a bad law for everybody." He adds that, since the 2015 incident at Spring Valley High, his department does not use that law. The district also does not use it. 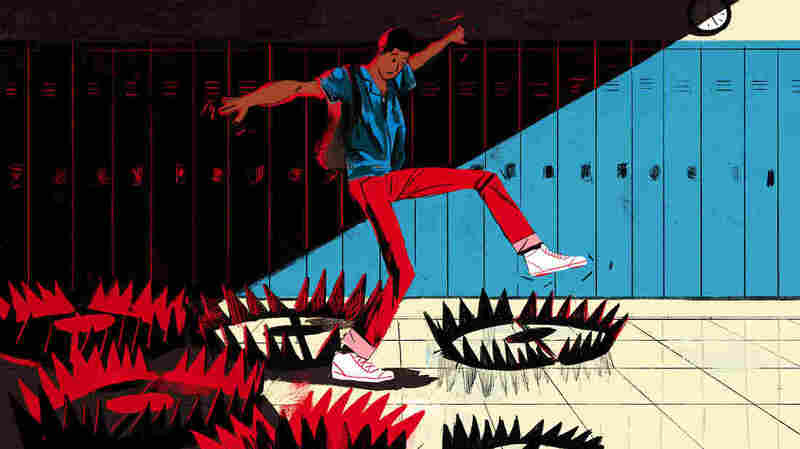 At the start of 2017, a group of senators introduced a bill that would narrow Disturbing Schools so that it cannot be applied to a school's own students — just trespassers. The bill now sits in a House Committee. As for the Richland Two district, officials say suspensions and expulsions are down overall and enrollment is up, though they declined to break down those figures by race. And everyone says they learned a lot from that video two years ago — and want to move on. "That was a very isolated event," says Helen Grant, the district's chief diversity and multicultural inclusion officer. After the national spotlight turned to the district, Grant and other educators set to work to examine the problems and make changes. The district formed a task force to hear from students. It organized dialogues with parents. And it hosted a training with school resource officers to clarify their roles. Grant emphasizes that SROs still have an important role: to enforce the law if a crime is committed. But, she adds, "we're hoping that our students become such good citizens, that they are not participating in any criminal misconduct, so that students would not need to come into contact with a school resource officer." Hugh Harmon and the other members of the Black Parents Association want their kids to be "good citizens," too. Except, their worry isn't just about how their kids behave — it's about how they're treated.